If you desire to stay at a hotel that is located in the vicinity of Heathrow Airport, the second busiest airport in the world, then you do not have to worry. You have a wide palette of options at your disposal, ranging from five star accommodations to accessible hotels, from luxurious interior design to common facilities. A warm recommendation for those of you that prefer a comfortable and modern accommodation is the popular Park Inn by Radisson London Heathrow. As the name hints as well, it is situated at a close distance from Heathrow. This is great if you have a flight to catch, thus eliminating any stress related to means of transport and traffic. Moreover, the accommodation provides more than 800 rooms, suitable for every type of budget, number of passengers and needs. There is a great restaurant and a quiet lounge, destined to help you relax and enjoy your staying. For corporate meetings and conferences, you can hire special spaces with modern facilities. In order to get a Luton Airport to Park Inn by Radisson London Heathrow Transfer by rail there are three main options. First of all, you could take the bus from Luton Bus Station (line 707 – once/day) via Heathrow Central Bus Station (every 5 minutes). This journey will take about 1 hour and 19 minutes in total. The second option is a train from Luton Bus Station (every 10 minutes), followed by a train from Luton (every 30 minutes) via King’s Cross St. Pancras (every 10 minutes) and ending with a bus from Hounslow West (every 5 minutes). This journey lasts about 1 hour and 35 minutes. You can also choose a bus from Luton Bus Station (line 888 – every 10 minutes) via St Albans City Railway Station (line 724 – every 60 minutes) and Uxbridge High Street (line 222 – every 10 minutes). This trip takes 2 hours and 11 minutes of your time. A Luton Airport to Park Inn by Radisson London Heathrow Transfer by car can be done by taking the M1 Motorway and then the M25 one. Luton Airport is at a 34.8 miles distance from Park Inn by Radisson London Heathrow. This journey will take about 36 minutes, without including traffic. A Luton Airport to Park Inn by Radisson London Heathrow Transfer with 247 Luton Airport Transfer is going to take about 55 minutes, including rush hour traffic. 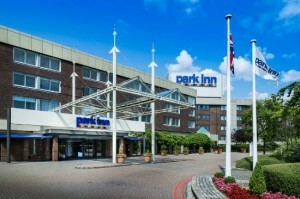 The price for a Luton Airport to Park Inn by Radisson London Heathrow Transfer starts from 54 GBP.